Secret Garden – 59ft 6″ traditional Narrowboat is a beautiful example of a well maintained narrowboat. She is in lovely condition with a beautiful Gardner 2LW engine. She was built in 1998 by Stowe Hill Marine and is fitted out in oak faced ply with predominantly solid oak floors. The well deck is a good size at nearly 5ft, and from here you enter the nearly 11ft saloon through stable type doors with portholes. Straight into the double sofa / dinette arrangement with storage under. This has a demountable table and converts into a double berth (the bed board is cleverly stowed and slides out from under the well deck). The are also two sliding glazed bulkhead doors which close off the well deck access giving light and protection from the wind. The Morso stove and further storage follows before entering the 8ft galley. There are two side hatches in this L shaped walk through arrangement and there is even an under-floor wine store along with the gas cooker, fridge and storage units. The bathroom is on the port side aft of the galley. It is a walk through one, with sliding doors at each end for privacy. This houses the hip bath with shower over, a pump out loo and the ceramic basin. The bedroom follows; a good sized room at 9’4” with the fixed double measuring in at 6’3” x 4’. There is storage under, along with a shotgun cabinet which serves as a safe. The 4ft wide mirrored double wardrobe is at the foot of the bed. Through another sliding door into the beautiful engine room (with two side hatches) housing the Gardner 2LW and the 5kw generator. The engine dates to 1947 (a winch engine on a vessel) and was rebuilt in 1995. There is also a cleverly adapted morso control which looks like the traditional speed control. She runs very well. The stern cabin is modelled on the traditional but modified. Lovely scumbling with roses and castles, but the port side is given over to the stove and cupboards, while the starboard side is a pair of comfy seats with demountable table in between which makes into a single berth. There is no cross bed, but it is a charming room with all the feel of the traditional. On board central heating is from the Eberspacher diesel fired system heating Finrads throughout the starboard side of the boat. 230v power is from the generator, landline or the 1500w inverter. 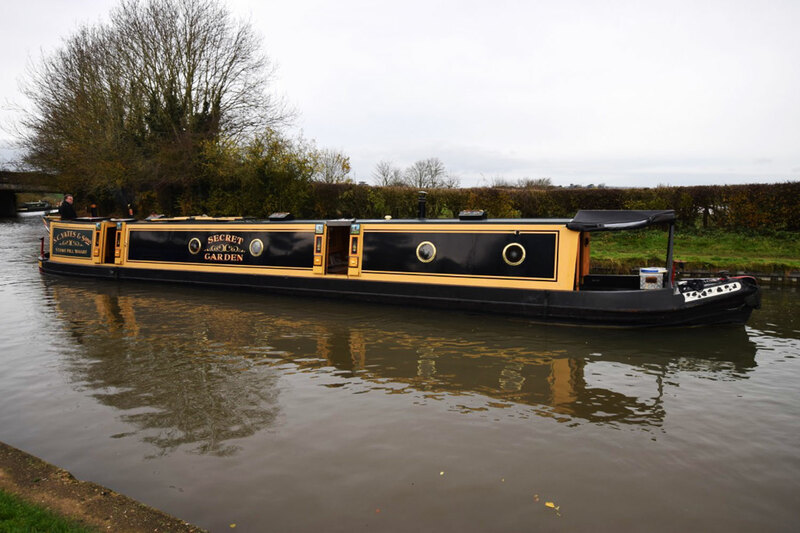 Secret Garden – 59ft 6″ Traditional Narrowboat is a lovely boat, lovely condition, lots of quirks and fitted out with all necessary for comfortable living or cruising.